If you love interior design and all things ‘home’, then you’ll probably be itching to know what designers are predicting as the hottest interior style choice of 2017. In 2016, Hygge became a hot lifestyle trend. Its philosophy is based on cherishing cosy time at home with loved ones, and the good news is that this is set to continue well into 2017 with homes that are all about comfort. But what else is on trend for this year? And how does beautiful flooring fit into that picture? To enhance the popular Hygge movement, there is lean towards the more natural look for this coming year with green being the main colour to watch out for. making a soft and interesting interior that enhances spaciousness and light. The Calcot Limestone Tumbled works well too. This tile has both looks and toughness for a stunning family home. 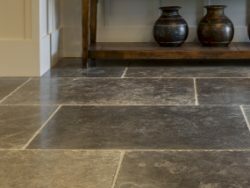 Also, consider the Carnaby Limestone Tumbled or the Firmdale Limestone Honed with its gentle tones of greige. You’d never think that green goes with grey, but it does, beautifully! Which is why marble and green are a match made in heaven. The sophisticated appearance of our Athena Marble Honed with its delicate grey veining, combined with an earthy, natural and gentle green on the walls, brings a calm balance to the home – much needed in this frenetic world. Green works wonderfully with darker tiles too such as our Olivier Limestone Tumbled to create a dramatic, cocooning effect, which is in keeping with the hygge movement and creates a contemporary and cosy interior. Another earthy trend that is set to revive this year is terracotta. The beauty of this warm and vibrant material is that it creates a characterful interior that perfectly reflects the Hygge movement. 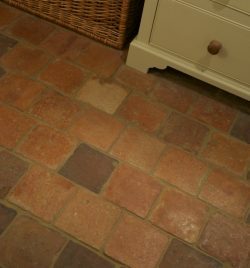 Our Antique Terracotta Reclaimed Brick is just the ticket to satisfy this trend. These beautifully aged tiles are over 200 years old and so have an authentic patina. Just imagine the cordiality of these tiles radiating out from a feature wall, or adding the perfect warming touch to a living area floor. In 2017 we will be seeing more of the burnished, darker steels and worn or antiqued metals that have started to show up on the pages of the hottest interior mags. 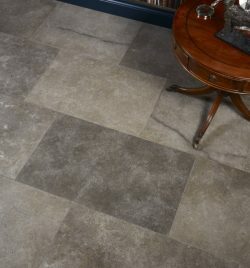 So accompany your metal fetish with Corfe Limestone Honed. Its moody tonal surface works well with the glint of metal. Quite simply, a beautiful match – dark wood and green in the same room. So, if you’re a fan of rich, dark wood furniture, then consider our Hazlebury Limestone Tumbled to accompany your sage green walls. 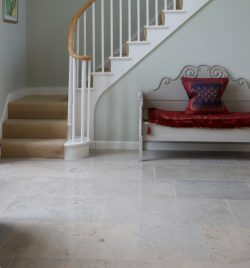 This handsome stone blends well into period properties and antique furnishings. The overall effect being a home that is truly beautiful. Take a look at our full range to see how you can create a hygge home fit for 2017.